Earlier this year, SoundWave was recognised by the High Sheriff of Cumbria for helping young people positively engage in their community through music workshops and events, and the charity received £1,000 to put towards youth activities. The money was used to run a music residential weekend at Blaithwaite House in Wigton as part of their Do It Yourself Music Festival, a 12 week programme of support, workshops, residentials, gigs and master classes. During the 3 day residential young people worked with a team of experts including Happy Mondays’ singer Julie E Gordon. There were also informal performance opportunities’ including Open Mic evenings and the young participants could road-test work they had created collaboratively during the weekend. 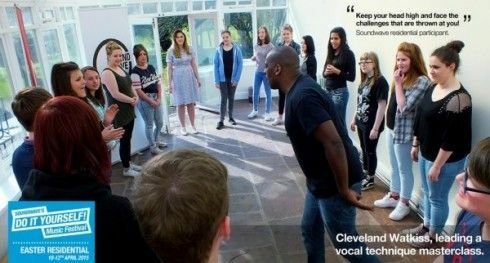 Soundwave, based in Workington, exist to work with youth professionals, musicians, artists, partners and stakeholders who share a commitment to provide access to music for those who are often overlooked in society; especially children and young people, and low income communities.